The art of grafting joins a branch of one variety of plant with the rootstock of another variety to create a stronger, more productive plant. Fruit trees and rose bushes are the most frequently grafted plants. A rose or fruit tree branch grafted onto a rootstock is called the scion. The area of tissue adhesion of the two cultivars is the cambium layer of cells. Grafting is meant to create plant and tree varieties with strong growth vigor and abundant blooms or fruit. Grafting a new variety rose onto an old variety rose rootstock gives better results than other methods of propagation. Grafting requires more time, skill and labor than other methods, but the results are more uniform growth of the new rose. A royalty fee must be paid to the patent holder to graft rose varieties in their first 17 years after introduction. 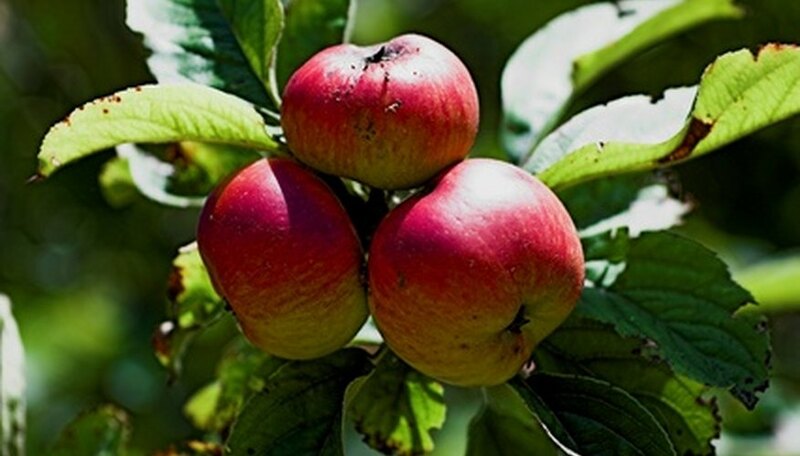 Hybrid fruit trees require up to 10 years to flower and reproduce from seed. Grafting the desired cultivar onto old rootstock speeds propagation. Cultivars are grafted onto dwarf rootstock to produce fruit trees eight to 12 feet in height. Dwarf grafted trees produce more fruit per acre and reduce maintenance costs. Grafting new cultivars onto old fruit trees is less expensive than replacing an entire orchard with a new variety. The T-bud method of grafting roses is done in August or winter when bark is easily removed from the plant. A bud is cut out from the stem of the desired cultivar. It is inserted into a straight, sharp cut in the rootstock. The bud is wrapped securely and left until springtime growth begins. The new cultivar plant tissue adheres to the rootstock to create the new rose plant. A cleft graft is created by making a sharp slit in the middle of the rootstock branch and shaping the scion into a wedge. The wedge is placed in the slit and wrapped until adhesion takes place. Veneer, or bark grafting, is easy and requires no special tools, according to the University of Missouri. The fruit tree stock is cut at a right angle in early spring when the bark separates easily from the wood. The scion should have two to three buds on a four- to five-inch section of branch, with a one-inch inward cut at one end. This end is inserted into the rootstock slit, held in place with electrical or masking tape, and allowed to heal over. Dehydration of the grafted bud is the most frequent cause of failure. Scion stems and branches should always be dormant but kept moist to ensure successful adhesion to stock. Fruit tree graft scions should have three to four buds per branch section. Scion and rootstock edges must be cleanly cut with a very sharp knife using long sweeping strokes to create clean lines. Whittling or sawing the edges prevents a good graft union from developing. Cut surfaces that come into contact with soil are contaminated with rot organisms that cause grafting failure.